This photo taken today by Jared Malsin was the best visual summarization of the situation of media in Egypt in general. 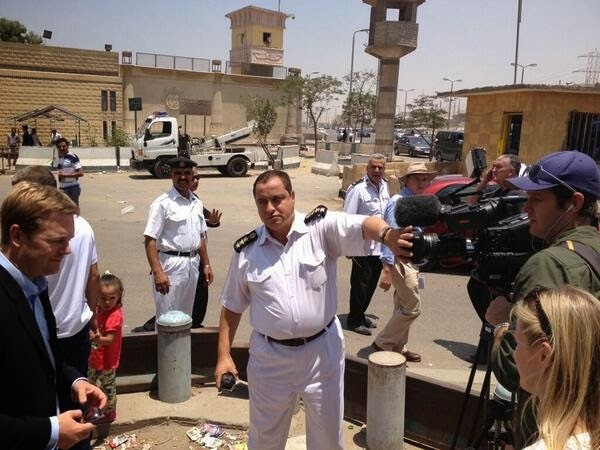 This was taken outside the court at Tora where the shameful trial of Al Jazeera journalists was held. This was after the trial. It seems like the new President is following in the footsteps of Putin. Its going to get difficult for all secular activists as well as the MB. Some sources say the new regime is supported by the Salafists who were rivals of the MB. Clearly people like El Baradei, could see the writing on the wall. this is bad i dont like it. The terrorist dictator Sisi has unambiguously defended the judiciary's barbarism and has demanded that the nation accept him as both a political and a religious leader. This man's ego delusions are insufferably ridiculous. What an unreasonable and irrational president. No, not ignorant. To deny what I said at this stage is what would be ignorant, as would be to believe that the convicted in this case are actually guilty. As has clearly been proven through multiple documented incidents (including data provided by this blog), Sisi is a known mass murderer/terrorist and has exhibited a childish view of how a judiciary should function in society. In that regard, Sisi is similar to other dictators in the region. It should also be obvious by now that his political career since late 2013 has been the result of ulterior motives. This includes his pronouncements and rhetoric about religion. Sisi is foolish to allow this judicial barbarism to go basically unchecked. No. Real ignorance is to deny what I said in the face of such overwhelming evidence. We have seen how Sisi has condoned mass murderer on various occasions, how he has acted like a dictator, and how he is employing religious, nationalistic, and militarist rhetoric to bolster his apparently long held ambitions ambitions. Furthermore, it is obvious that the trial against these journalists is an affront to human reason, relying as it does on unproven, absurd convictions. Even if Sisi does eventually issue a pardon, an enormous amount of damage has been done.